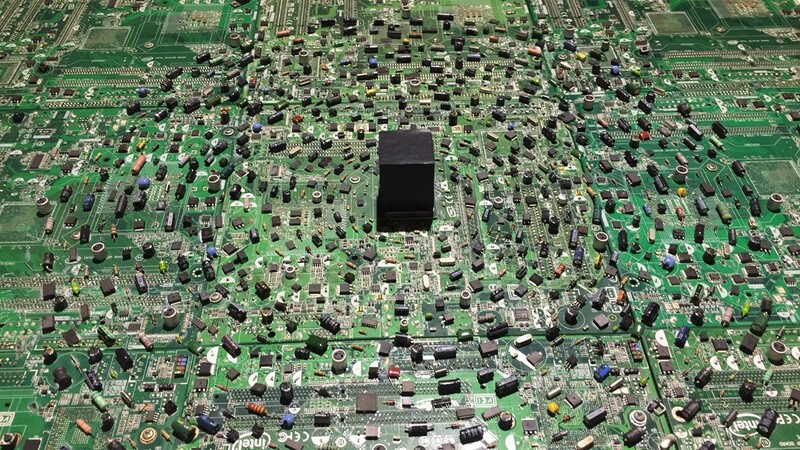 Dearborn, Mich. (June 19, 2017) – Epicenter X: Saudi Contemporary Art in Dearborn, MI represents the first exhibition of its kind from the Kingdom of Saudi Arabia to appear in Michigan. This timely exhibition opens in the Main Floor Gallery, Courtyard, Second Floor Atrium and The Annex at the Arab American National Museum (AANM) on July 8, 2017, and runs through October 1, 2017. The Museum welcomes the public to a free opening reception at AANM 7-9 p.m. Saturday, July 8, 2017; RSVP requested at http://bit.ly/EpicenterXrsvp. Epicenter X explores contemporary Saudi culture by promoting meaningful dialogue between Saudi artists and U.S. audiences. Furthermore, the exhibition sheds light on the vast diversity of contemporary artistic practice in Saudi Arabia. Cutting through the political discourse of media outlets and government officials, the artworks featured in this exhibition open doors to the lives of the Saudi people. In doing so, this presentation will challenge common views and stereotypes of Arab culture by lending voice to artists exploring poignant ideas centered on urbanization, globalization, religion and the impact of American popular culture in Saudi society. Both Dearborn, Michigan, and Saudi Arabia serve as iconic social and cultural epicenters. Dearborn lays claim to the highest concentration of Arab Americans in the U.S., and has been the final destination for immigrants from the Arab World for nearly a century. Saudi Arabia is home to the two holiest sites of Islam and functions at a crossroads of culture, most notably during the annual pilgrimage to Mecca. The exhibition comes not long after President Trump’s much-publicized visit to Saudi Arabia. A variety of works in diverse mediums by both established and emerging artists will be featured in the exhibition. Highlights include photographs by current AANM resident artist Ayman Yossri Daydban; Ahmed Mater’s Golden Hour photograph from his Desert of Pharan series; Qamar Abdulmalik’s Asylum of Dreams installation; Marwah Al Mugait’s latest video installation We Were; Abdullah Al Othman’s multi-channel video installation The Experiment from the No-touch Torture Series; and design by Yusef Alahmad. Also featured in Epicenter X are three contemporary Qut murals (first shown in the United Nations Headquarters in New York in 2015) created in the age-old traditional style of house-painting by skilled female artisans from Southwestern Saudi Arabia. Epicenter X marks the sixth stop on a multi-city Saudi artist’s tour of the U.S., and is supported by Ithra, and coordinated by CULTURUNNERS. The tour, which launched in 2016 at the Station Museum in Houston, Texas before traveling to the Gonzo Gallery in Aspen, CO; Minnesota Street Project in San Francisco, CA, Bates College Museum of Art in Lewiston, Maine, and Los Angeles County Museum of Art (LACMA), CA; aims to generate people-to-people dialogue and better understanding between nations. Following a run at the Arab American National Museum in Dearborn, Michigan, the tour will continue to Salt Lake City, Memphis, Washington D.C. and New York. At Ithra, we believe in the power of people and ideas to unlock new possibilities: the future is what we make of it. AANM – an institution of Dearborn, Mich.-based human-services agency ACCESS – is accredited by the American Alliance of Museums; an Affiliate of the Smithsonian Institution; and a founding member of the Immigration and Civil Rights Network of the International Coalition of Sites of Conscience.